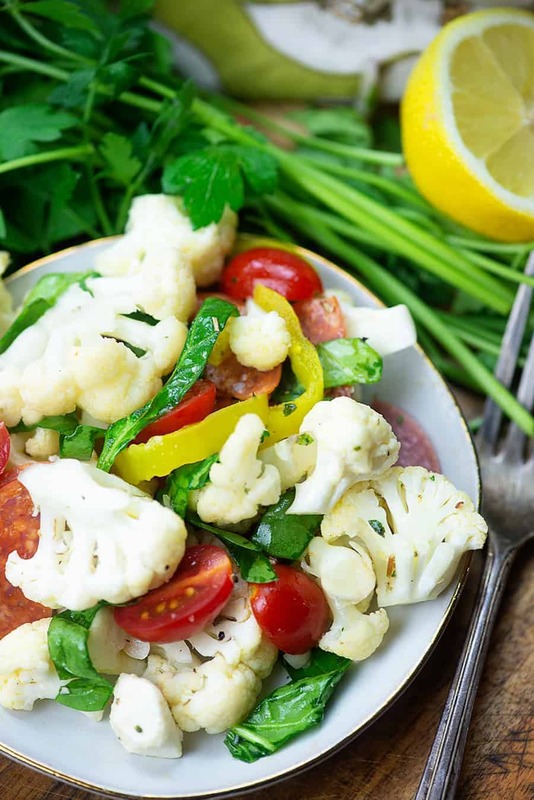 Italian Cauliflower Salad makes a great summer low carb side dish for any barbecue or gathering. It’s packed with fresh mozzarella, pepperoni, salami, and more all tossed in a simple homemade Italian salad dressing. 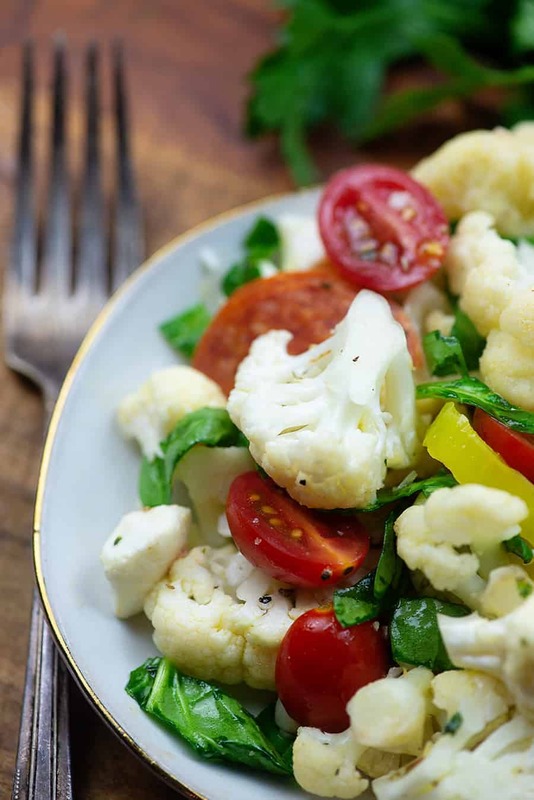 You’ll want to serve this cold cauliflower salad all summer long! Lately, I’ve been spending my afternoons in the backyard, floating around our pool. Being outside in the hot summer sun means that at dinner time I want something fresh and tasty and light. If I can convince the husband to toss some meat on the grill while I whip up a cold salad, even better. 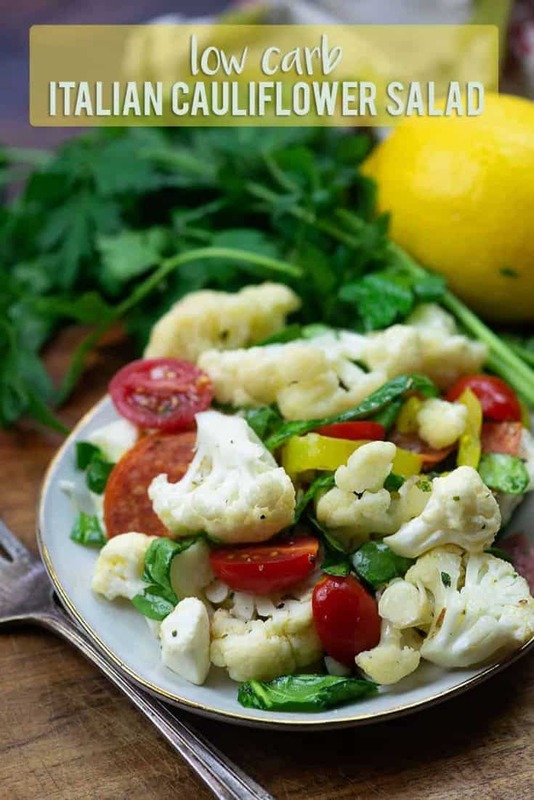 This cauliflower salad is a great side dish to anything off the grill, in my opinion. And it also doubles as a nice lunch since it’s so packed with goodies! I like to start this cauliflower salad with fresh cauliflower florets. You can chop a head of cauliflower or you can purchase a bag of florets, but definitely don’t start with frozen cauliflower here. I chop the cauliflower into bite-sized pieces and pop it into a large microwave-safe bowl. Add in a couple tablespoons of water, cover with plastic wrap, and microwave for 3 minutes. We’re not fully cooking the cauliflower much here, but I do like to soften it just a touch. You can skip this step if you’d prefer raw cauliflower – it’ll be extra crunchy that way. Once the cauliflower is softened just a bit, drain the liquid from the bowl and start tossing in the good stuff. 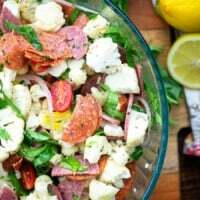 For this cauliflower salad recipe, I’ve added fresh mozzarella balls, chopped spinach, pepperoni, salami, halved grape tomatoes, red onion,, and pepperoncini. You can toss in whatever ingredients sound good to you here, keeping in mind that it’s all going to get tossed in our homemade Italian dressing. For the dressing, you’ll start with your favorite olive oil and some lemon juice. Sprinkle in some dried herbs. I’ve used rosemary, basil, and oregano. You’ll also add in some freshly minced garlic and then season the dressing with some sea salt. 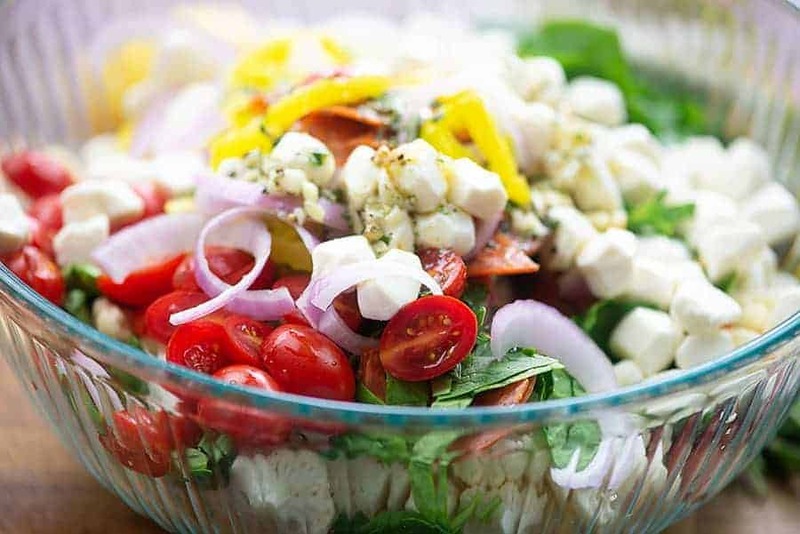 Whisk the Italian salad dressing together and give it a quick taste. 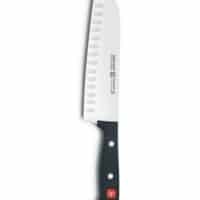 Adjust with more lemon juice, salt, or herbs as desired. 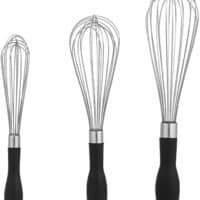 I like mine more on the tart side and nearly always add additional lemon juice. Pour the salad dressing over the cauliflower salad and toss to combine. I like to let this set in the fridge for a couple of hours before serving to allow the flavors to meld, but it’s fine to serve it straight away too. Steak Bites – The marinade for this steak recipe is my all time favorite! Spinach Stuffed Chicken – a true reader favorite! Have you tried this one yet? Garlic Butter Shrimp – such an easy recipe and how can you say no to garlic butter?? Bacon Wrapped Meatloaf – I’m a sucker for anything wrapped in bacon and the low carb BBQ sauce on top is so good! Keto Coleslaw – this is my mama’s famous recipe! Broccoli Salad Recipe – cheese, bacon, ranch, broccoli. You really have to try this one! 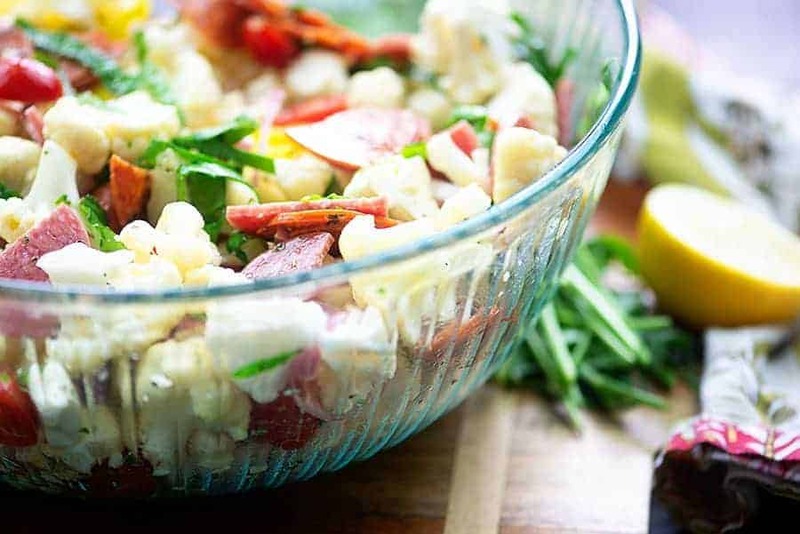 Cauliflower ‘Potato’ Salad – another summer favorite in our house! 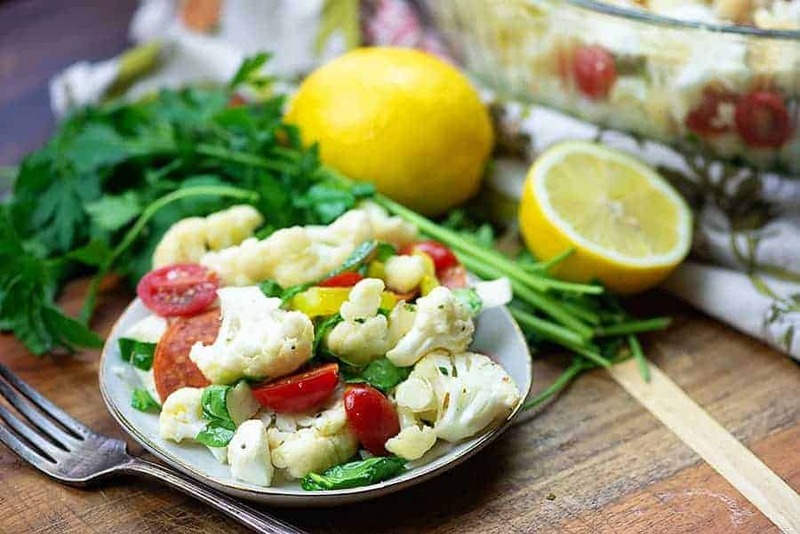 Hope you guys enjoy this Italian Cauliflower Salad! For more recipes, be sure to follow along on Facebook! 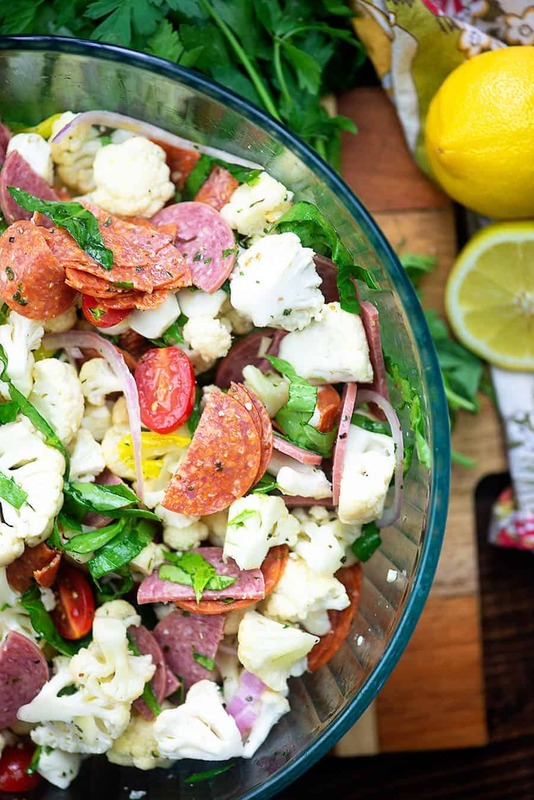 This cold cauliflower salad is packed with fresh veggies, salami, and pepperoni. The homemade Italian dressing adds so much flavor! Chop the cauliflower into bite-sized pieces and place in a large microwave-safe bowl. Add 2 tablespoons of water, cover with plastic wrap, and microwave for 3 minutes or until as tender as you'd like. Drain the liquid from the bowl. Slice the grape tomatoes in half. Chop the spinach into small pieces. Cut the pepperoni and salami slices in half. 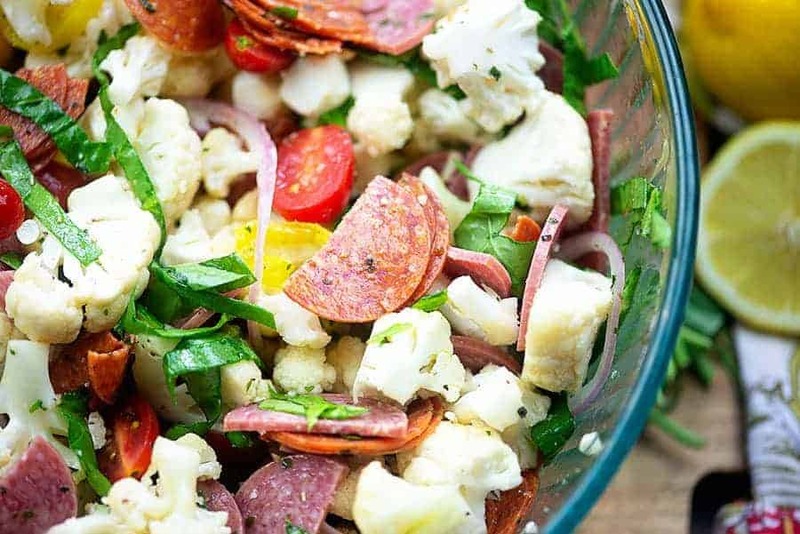 Add the tomatoes, spinach, pepperoni, salami, mozzarella, onion, and pepperoncini to the bowl with the cauliflower. Cover the bowl and refrigerate for 2 hours to allow the flavors to meld before serving. What is the serving size? I know it feeds eight but hoe big is a serving? Thanks. And it is yummmmmy. I made this for a 4th of July party … very yummy! I added Chicago Steak Seasoning to add a little heat/spice to it. The price of cauliflower has been outrageous around my area lately….so I tried making this with frozen cauliflower. It’s NOT as good…but it worked. I don’t care for cooked cauliflower. Would it be good if I just used raw cauliflower? I think it’d be fine, if you don’t mind the crunch. How long can you let everything sit in the fridge? I’m making for work party and not sure if I can make ahead and let it sit during the day or put together right before serving? I don’t want it all to be too wilty. I think this would be fine made the day ahead! Maybe stir the spinach in just before serving, but otherwise it should be good. What are the total carb grams per serving? Nutrition info is in the recipe card. I need olives in there but i love the combo!! Have been missing my Italian pasta salad so this is perfect!! Wondering why you didn’t add vinegar to the dressing? Is the lemon the substitute? Wonderful recipe! I used the lemon in place of vinegar.